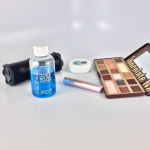 I was looking through some of my posts recently trying to decide which one to link up in a link party and I realized that it had been awhile since I’d done a “One Brand Tutorial.” I decided that I wanted to do another soon but the trick was deciding what brand to use. As Fate would have it, around the same time I was sent several of L’Oréal’s 2016 new products. It was decided! 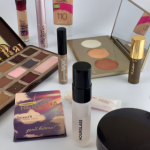 In this One Brand Tutorial I partnered products that I already had, products I was sent, and new products I had purchased. 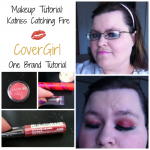 Make sure to check out the video for the full tutorial as the post just covers the products that were used! Before we get into the L’Oréal products that were used I do want to mention that I did moisturize with Nivea Soft Moisturizing Creme and I primed my face with the Smashbox Photo Finish Primer Water. The very first thing that I put on in the tutorial was L’Oréal True Match Foundation. I did this because I knew I was going to bring some of it over my eyes an eye primer. Later in the tutorial I used L’Oréal True Match Super Blendable Blush in Baby Blossom. This line of blushes is so cool as they have shades that are marketed towards the skin tone that you have, for reference Baby Blossom is cool toned. 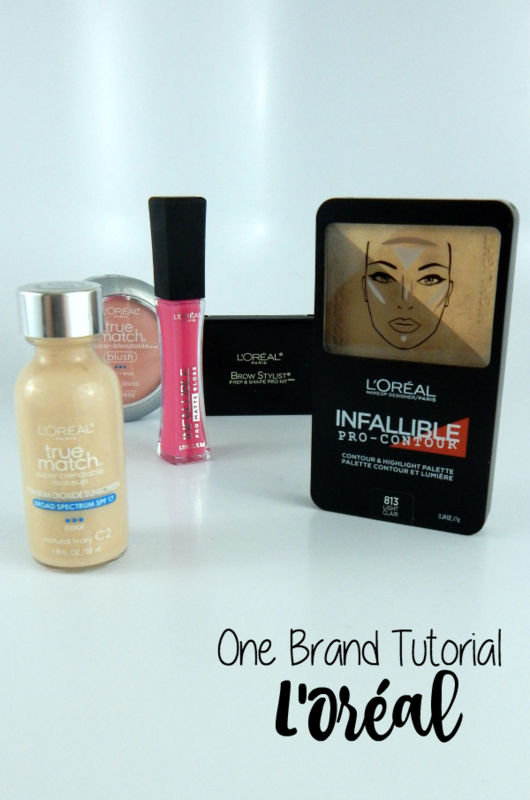 For contour and highlight I used the L’Oréal Infallible Pro Contour in Light. I LOVE the brush and the contour powder in this palette, however, the highlight just isn’t “POPPIN” enough for me but that’s just personal preference. After finishing with the foundation I moved onto eye shadow. L’Oréal’s Colour Riche Eyeshadow Monos are AUHMAZING. 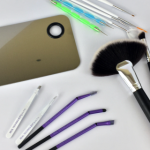 They have a gel to powder formula that makes them super pigmented and super blendable! While I only used four shades (Paris Beach, Little Beige Dress, Sunset Seine, and Petite Perle) for this specific tutorial, I already know so many other combinations that I’m planning. Did you think that I wouldn’t let you see how gorgeous these shadows are? I got swatches of all the shades, and I’ll make sure to point out which ones are the ones I used in the tutorial! This swatch contains Paris Beach, Little Beige Dress, Sunset Seine, and Café Au Lait. 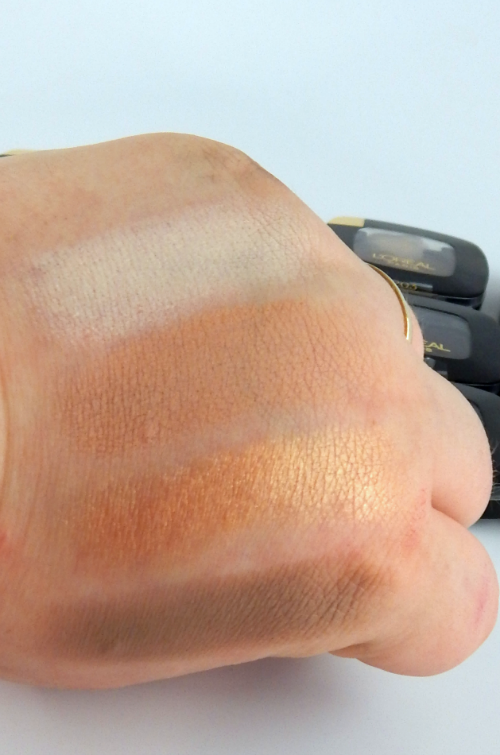 The first three shades are included in the tutorial. I want to make sure to point out that this set of swatches does have four swatches. The last one is just really tucked in down at the bottom! This swatch contains Quartz Fumé, Petite Perle, Mademoiselle Pink, and Pain Au Chocolat. Petite Perle is also used in the tutorial. If you’ve been paying attention then you may have put together that we’ve already covered all the shadows that I used in the tutorial! There’s still more to go though! This swatch contains Violet Beauté, Noir C’est Noir, Argentic, and Grand Bleu. If you’re wanting to smoke out a look or are wanting to use a black shadow as an eyeliner Noir C’est Noir is for SURE the way to go. It’s so freaking pigmented and it stays put! This swatch only has three in it! 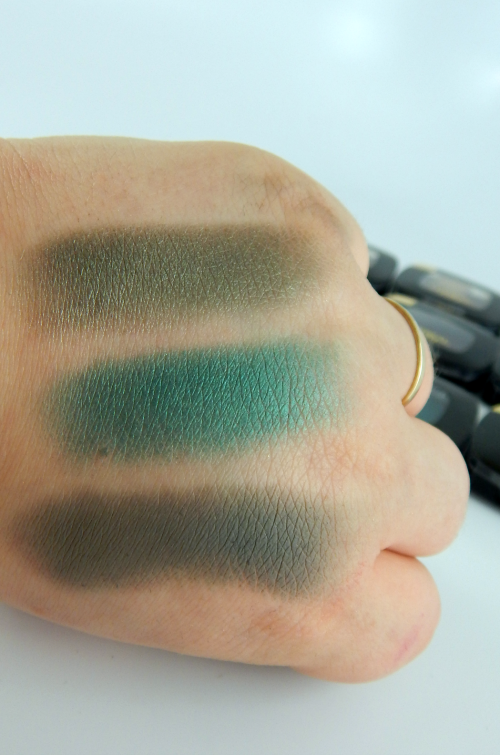 That means we’ve made it to the end of the eye shadow swatches! You know I had to save the best for the last, these three shades are hands down my favorite in the whole bunch. This swatch contains Green Promenade, Teal Couture, and Meet Me in Paris. After finishing with my shadow I moved onto my lashes because you know they needed some length, volume, and to be noticeable! I love that the L’Oréal Voluminous Superstar Red Carpet Mascara has a primer on the other end! I used to have the L’Oréal Double Extend Mascara but I used it ALL and it’s super hard to find in my area so when I got this I was beyond excited. Imagine how thrilled I was when I realized it performed even better than the Double Extended! 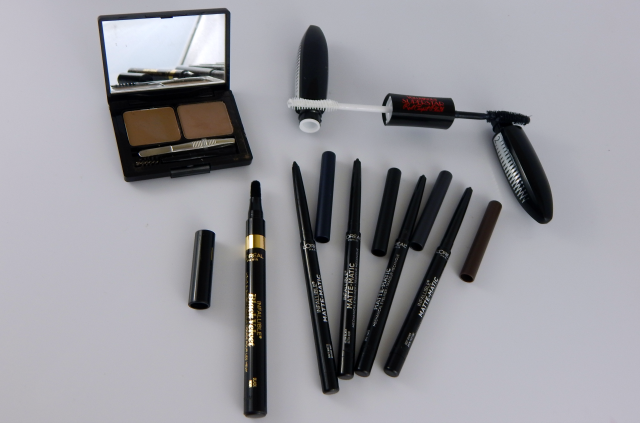 The Red Carpet Mascara gives me length and volume, lasts all day, and just makes my eyes POP. I also filled my brows in with the L’Oréal Brow Stylist palette in Light to Medium. I love that this comes with a brush/spoolie and a small set of tweezers. I also really like the powder in the palette but I’m not to fond of the wax though. Also pictured above are two different types of the Infallible liners. 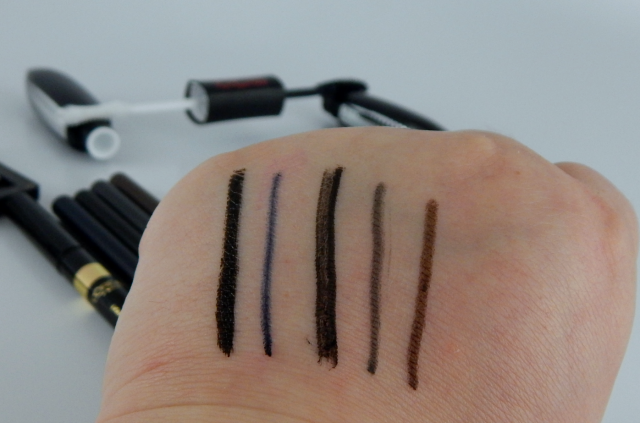 Starting from the left the first swatch is the L’Oréal Infallible Black Velvet Liner, the tip of this is velvety and soft and it makes an AMAZING line on the eyes! 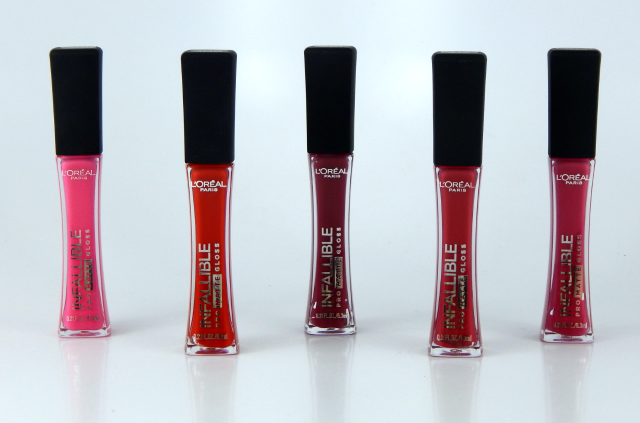 The next four are L’Oréal Infallible Matte-Matic Liner swatches in different shades; Navy Matte, Ultra Black, Taupe Grey, and Deep Brown. The end of these has a built in sharpener that pulls out and these retract up and down. When it comes to lining though I really liked the velvet liner over the matte liners. I just KNEW you were looking at that photo trying to determine what exactly some of those shades would like as they can be a bit similar in the tube. On the skin/lips it’s a whole different story let me tell you! 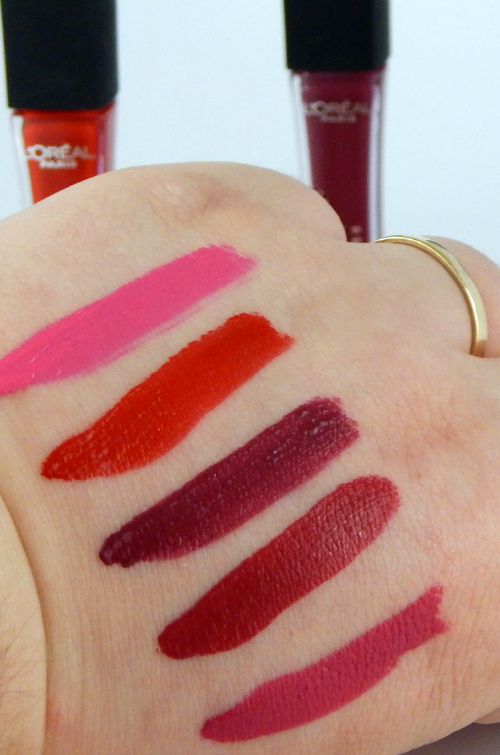 These are the shades from top to bottom so that you can make the best decision for you; Fuchsia Amnesia, Shanghai Scarlet, Forbidden Kiss, Rouge Envy, and Rebel Rose. I don’t know where to start – all of the shadows are amazing. 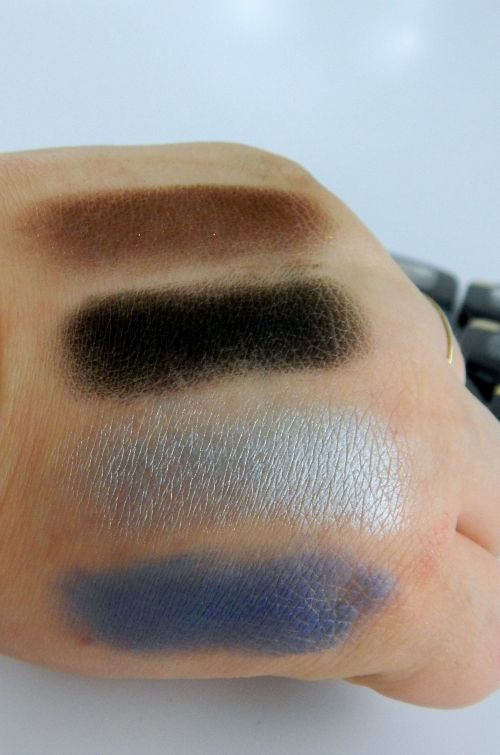 And those liners – I want to try the Navy Matte and the Deep Brown. Those shades tend to compliment my blue eyes more than just basic black. Forbidden Kiss is my favorite gloss. I am loving those eye shadow colors! They really have a nice shimmer to them. I love all those eye shadows. They look so pigmented and they aren’t flaky or chalky unlike many eye shadows. The range of their shades is impressive. You can really have the exact color and shade depending on what’s good for you and what’s the occasion. L’oreal is a great brand. 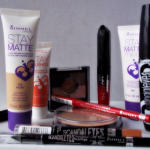 I love that they have great-quality products at affordable drugstore prices. I’ve actually been really curious about trying their lip gloss. So I think I’ll pick some up the next time I’m at the store. There are a lot of really pretty eye shadow colors. I love the shade that you went with for your lips too! I’m just about to toss out a bunch of old make up. L’Oreal is a brand I trust so this was fun for me to read. Nice tutorial. I love the lip glosses. Its a rainbow of color and screams spring and summer. 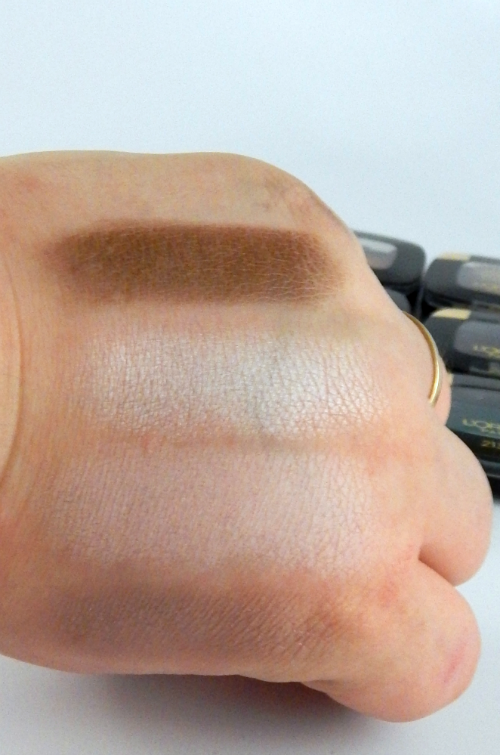 A shade for everyday use, including night time too. Great post! I love the eye shadows! My favourite was “teal couture”. It’s such a gorgeous dramatic green! 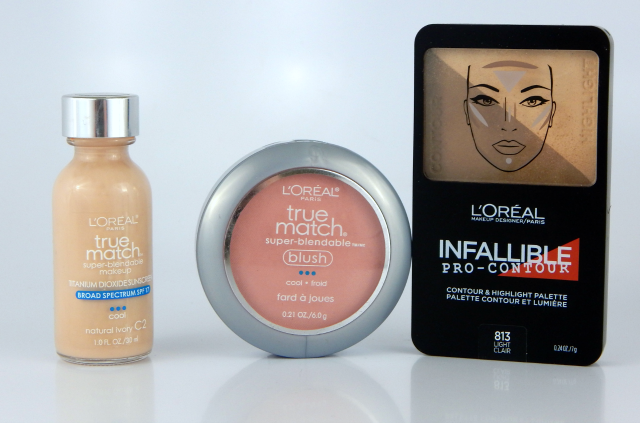 I need some new makeup and I love L’Oreal and these shades. The prices of these products are very reasonable too. I love lip gloss, it’s a must have and just about all I wear on my lips. That color would be perfect for summer. Thank you for your tutorial. Just recently, I’ve been wearing more makeup. 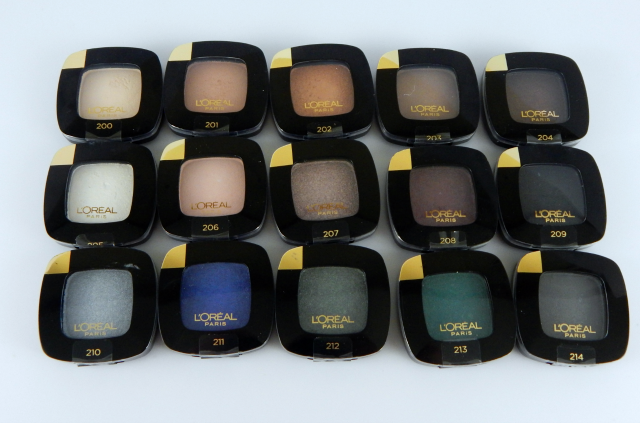 Loreal has been a favorite of mine for quite sometime. I own a few of their lipsticks. I love the true match brand! 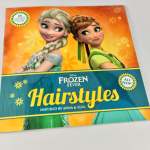 I’d like to try the contouring. I’m going to grab some the next time I’m at the store! Love this! You make me want to use make up more often. I have an event coming up at the beginning of April I’m going to and will be doing make up. 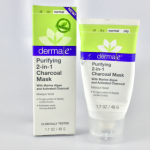 I have a few of these products so now I’m looking forward to it! I don’t really wear foundation anymore, but when I did, I loved the True Match. I’ve always had a hard time finding foundation that didn’t look pink on me and this one really worked well. Oh, how fun. I’d love to try L’Oréal’s Colour Riche Eyeshadow Monos – bring on the Paris Beach – although wait, Paris has a beach? Whatever. The colours are fab. 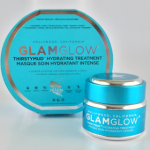 It looks like, they have wonderful products!! I need to check all beauty products of this brand!! Thanks for your review! !